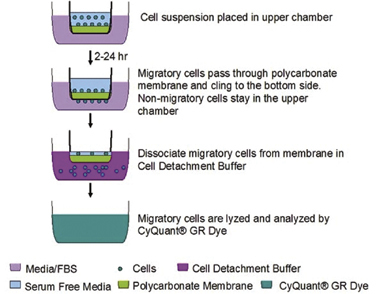 5 µm Chemotaxis Assays, 96-Well Format | Cell Biolabs, Inc.
Chemotaxis describes the movement of cells toward or away from a chemical stimulus in their enviroment. Cell chemotaxis plays a pivotal role in the progression of cancer and other diseases. CytoSelect™ Cell Migration Assays are ideal for determining the chemotactic properties of cells. The 5 µm pore size is ideal for monocytes / macrophages. Figure 1: CytoSelect™ Chemotaxis Assay Principle. Migratory cells move through the polycarbonate membrane toward a chemoattractant underneath the membrane inserts. Cao, Q. et al. (2016). Myeloid deletion of α1AMPK exacerbates atherosclerosis in LDL receptor knockout (LDLRKO) mice. Diabetes. 65:1565-1576. Yao, L. et al. (2016). Characterization of liver monocytic myeloid-derived suppressor cells and their role in a murine model of non-alcoholic fatty liver disease. PLoS One. 11:e0149948. Jiang, W. et al. (2016). Infiltration of CCR2+ Ly6Chigh proinflammatory monocytes and neutrophils into the central nervous system is modulated by nicotinic acetylcholine receptors in a model of multiple sclerosis. J Immunol. 196:2095-2108. Hargarten, J. C. et al. (2015). Candida albicans quorum sensing molecules stimulate mouse macrophage migration. Infect Immun. 83:3857-3864. Kondo, Y. et al. (2015). Differential expression of CX3CL1 in hepatitis B virus-replicating hepatoma cells can affect the migration activity of CX3CR1+ immune cells. J Virol. 89:7016-27. Baek, J. H. et al. (2015). IL-34 mediates acute kidney injury and worsens subsequent chronic kidney disease. J Clin Invest. doi: 10.1172/JCI81166. Willy, J. A. et al. (2015). CHOP links endoplasmic reticulum stress to NF-κB activation in the pathogenesis of nonalcoholic steatohepatitis. Mol Biol Cell. doi:10.1091/mbc.E15-01-0036. Zhang, C. et al. (2015). Beta-endorphin cell therapy for cancer prevention. Cancer Prev Res (Phila). 8:56-67. Cao, Q. et al. (2014). Inhibiting DNA Methylation by 5-Aza-2'-deoxycytidine ameliorates atherosclerosis through suppressing macrophage inflammation.Endocrinology. 155:4925-4938. Cizkova, D. et al. (2014). Alterations of protein composition along the rostro-caudal axis after spinal cord injury: proteomic, in vitro and in vivo analyses. Front Cell Neurosci. 8:105. Wu, Y. S. et al. (2014). Studies of macrophage cellular response to the extracellular hydrogen peroxide by tilapia model. Fish Shellfish Immunol. 36:459-466. Moll, H. P. et al. (2014). A20 Regulates Atherogenic Interferon (IFN)-γ Signaling in Vascular Cells by Modulating Basal IFNβ Levels. J Biol Chem. 289:30912-30924. Wennerberg, E. et al. (2014). Human Anaplastic Thyroid Carcinoma Cells Are Sensitive to NK Cell-Mediated Lysis via ULBP2/5/6 and Chemoattract NK Cells. Clin Cancer Res. 20:5733-5744. Jun, H.S. et al. (2012). Glucose-6-Phosphatase-β, Implicated in a Congenital Neutropenia Syndrome, is Essential for Macrophage Energy Homeostasis and Functionality. Blood. 119:4047-4055 (#CBA-105). Sarkar, D.K. et al. (2011). Transplantation of ß-Endorphin Neurons into the Hypothalamus Promotes Immune Function and Restricts the Growth and Metastasis of Mammary Carcinoma. Cancer Res. 71:6282-6291 (#CBA-105). Christophi, G. et al. (2008). Modulation of Macrophage Infiltration and Inflammatory Activity by the Phosphatase SHP-1 in Virus-Induced Demyelinating Disease. J. Virol. 83:522-539 (#CBA-105). Caglayan, E. et al. (2008). Differential Roles of Cardiomyocyte and Macrophage Peroxisome Proliferator-Activated Receptor Gamma in Cardiac fibrosis. Diabetes 57:2470-2479 (#CBA-105).